Weighty Matters: Stupidest Cookies Ever? "A Source of Omega-3 Polyunsaturates!" 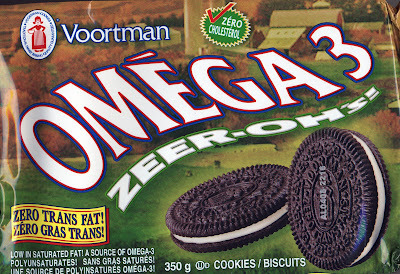 Yup, those are all the claims currently on the front of Voortman's phenomenally stupidly named, "Omega-3 Zeer-Ohs!" cookies and if the food industry has its way, there will soon be more. Stay tuned tomorrow when I introduce you to the goings on behind the scenes at the current Happy Corporations (Health Canada) consultations into food labeling where surprise, surprise, the food industry has an invited seat to the table, the process is skewed dramatically in their favour, and with industry of course wanting it be made easier for them to make outlandish health claims on foods (health sells) in the absence of real evidence to support them. "Supportive but not conclusive research shows that consumption of EPA and DHA omega-3 fatty acids may reduce the risk of coronary heart disease. One serving of Omega-3 Zeer-Ohs! provides 0.5 grams of EPA and DHA omega-3 fatty acids." And then perhaps Voortman's will rename them, Omega-3 Super Heart Healthy-Ohs!.